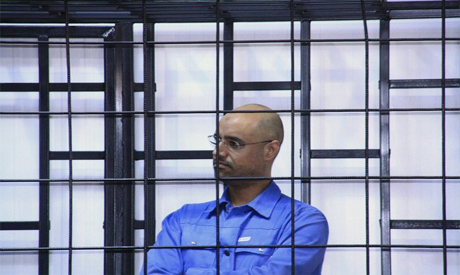 Saif al-Islam Gaddafi, the most prominent son of the former Libyan leader, should play a role in his country's political life, Russian Deputy Foreign Minister Mikhail Bogdanov was cited as saying on Monday by the RIA news agency. RIA said that one of Saif's representatives had delivered a letter from him to Moscow earlier this month in which he had set out ideas for the political future of Libya and that Saif was in regular contact with Russia. Western powers and the United Nations are pushing for the North African country to hold elections next year after a national conference to try to end seven years of conflict in the oil producer. Saif's father was toppled and killed in a 2011 revolt. Saif, who was detained afterwards before later being freed, was seen by some as a potential reformist successor to his father in the years before 2011 and remains a key figure for Gaddafi loyalists. "We support everyone. We believe that nobody should be isolated or excluded from a constructive political role," RIA cited Bogdanov as saying. "That's why we are maintaining contacts with all groups who are based in the west, east and south of the country ... Saif al-Islam has the backing of specific tribes in specific areas of Libya and all this should be part of the overall political process with the participation of other political forces." Russia is also in close contact with Libyan commander Khalifa Haftar who dominates eastern Libya and has visited Moscow and held talks with top officials.